The Rs 1,336 proposed by McKinsey will neither help run this household in rural Karnataka nor provide any ’empowerment’. 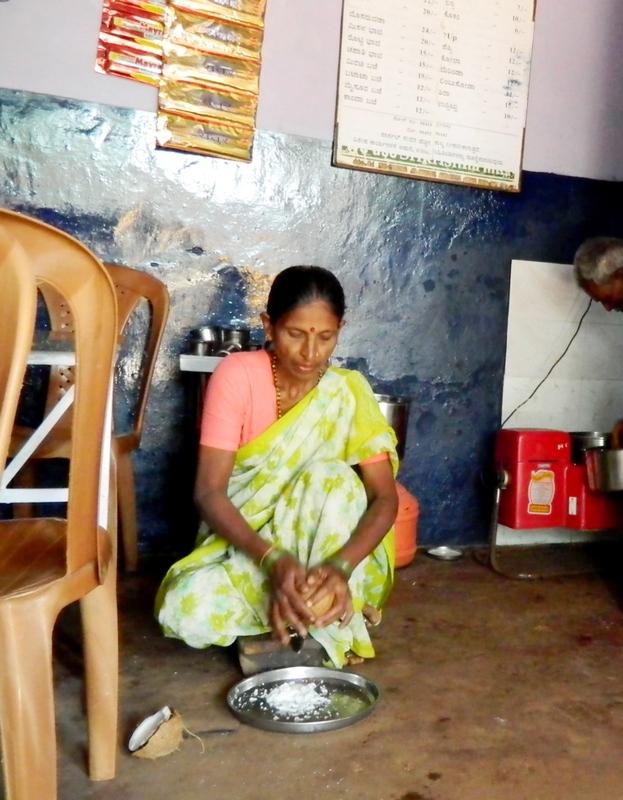 The family’s entrepreneurship, running a cooked food stall in a part of the house, keeps it comfortably above the poverty line. 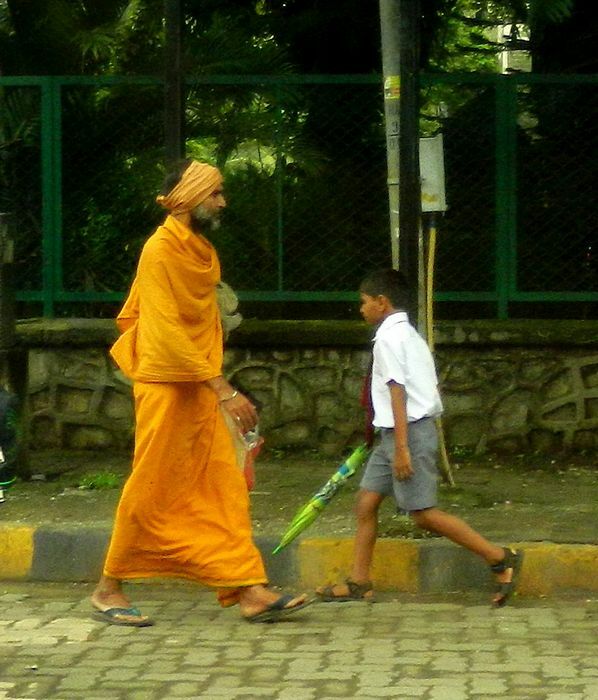 There is a new contributor to an old subject in India. The subject is poverty, and the newcomer is a management consulting company. This sort of company has no experience with such a subject, however the McKinsey Global Institute – which works as “the research arm of consulting company McKinsey” – has not been short of advisers on the matter. What does this consulting company say and why should we keep an eye on their activity in this subject? This institute has issued a report called ‘From poverty to empowerment: India’s imperative for jobs, growth and effective basic services’. The proposal, unabashedly touted as new thinking, is that India should focus not on a poverty line but on a “more comprehensive measure of what it would take to satisfy a person’s basic needs for food, energy, housing, drinking water, sanitation, healthcare, schooling and social security”. This new thinking – presented as a startling innovation in the same way that a new brand of running shoes or some such frippery is launched – is called an “empowerment line”. This ‘line’ has been placed at Rs 1,336 rupees a month – which McKinsey points out is about 50% higher than the national official poverty line. What is sought to be fixed at the bidding of the current government of India and at what cost? 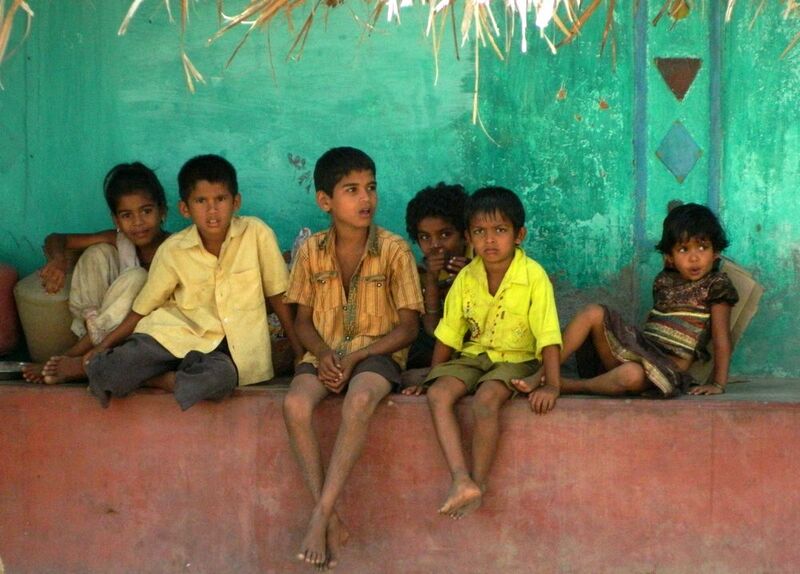 This new report by the McKinsey Global Institute suggests that Rs 330,000 crore should be spent over the next 10 years to “empower 680 million Indians who are only marginally better than those under the poverty line”. And moreover that this spending be increased to reach 1.08 million crore by 2022 because “the government’s spending on various development schemes” does not “effectively reach much of the public”. At current rates of exchange, that is US$ 173 billion and what handsome percentage of that will be marked (or unmarked) as consultants’ fees? Likewise, we must also examine those who have provided, as McKinsey has said, “insights and guidance” for this work. Among those listed are Subir Gokarn, director of research of Brookings India and former deputy governor of the Reserve Bank of India; Vijay Kelkar, chairman of the India Development Foundation, former chairman of India’s Finance Commission, and former finance secretary, Government of India; Montek Singh Ahluwalia, deputy chairman of the Planning Commission of India; Arun Maira and B K Chaturvedi, members of the Planning Commission of India; Rakesh Mohan, India’s executive director at the International Monetary Fund; Nandan Nilekani, chairman, Unique Identification Authority of India; S Ramadorai, adviser to the Prime Minister, National Council on Skill Development; and Soli Sorabjee, former attorney-general of India. 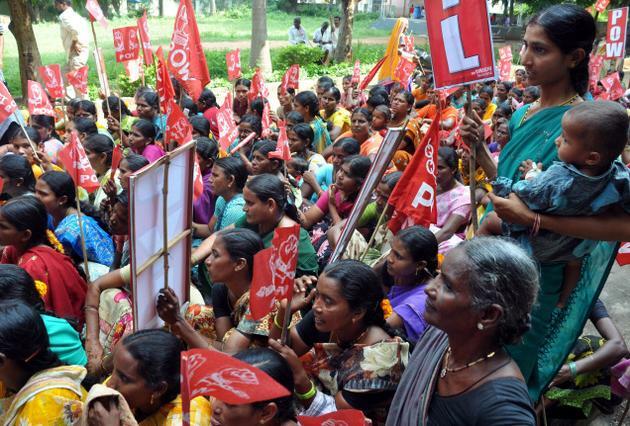 Disconnected entirely from the dynamics of district livelihoods and factors that influence income and well-being, consulting companies such as McKinsey must not continue to be engaged by central and state governments in any capacity. These people are votaries of the thesis that GDP growth is good, and that all policy must conform to such a doctrine. Hence it becomes easier to see the connection between the direction that the UPA 1 and UPA 2 governments have taken till here, and the firm grip finance and industry have on the country’s journey into ‘development’, aided by the outpourings of management consulting companies such as McKinsey. This ‘empowerment index’ is nothing but a repetition of the desire that over the period 2010-20, urban India must create 70% of all new jobs in India and these urban jobs will be twice as productive as equivalent jobs in the rural sector, as stated in ‘India’s Urban Awakening: Building Inclusive Cities, Sustaining Economic Growth’, a report by the McKinsey Global Institute issued in early 2010. The expectation is that as India’s cities expand, India’s economic profile will also change. In 1995, India’s GDP was divided almost evenly between its urban and rural economies. In 2008, urban GDP accounted for 58% of overall GDP. By 2030, according to the McKinsey report’s calculations, urban India will generate nearly 70% of India’s GDP. Such a transformation, if it comes to pass, is expected to deliver a steep increase in India’s per capita income between now and 2030 wherein the number of middle class households (earning between Rs 2 lakh and Rs 10 lakh a year) will increase from 32 million to 147 million. And it is against the drawing of that alarming line of minimum urbanisation drawn four years earlier, that this new line must be viewed, together with the injunction that “India can bring more than 90 percent of its people above the Empowerment Line in just a decade by implementing inclusive reforms”. Were our crops to be tied, cyclically and in uneasy dependence, to the trickles of credit, India’s food stocks would be in a desperately poor state and food insecurity would stalk every district. To hear it from the Government of India and its multitude of agencies and allies, all of which in one way or another are connected with agriculture and food, the needs of the kisan (farmer) can be well met, and it takes only the kisan, toiling soul that she is, to “avail” of such plenitude. Easier stated than done. We may not doubt the intentions that have made these provisions, but we prefer to see proof on the ground, in the fields of our marginal and small farmers, rather than as optimistic indicators that adorn the pages of reports read by no farmer. Where is this disconnection taking place? To borrow from the world of film, Yojana Bhavan and Krishi Bhavan, we have a problem! And it is this: the basis of every school of conventional economic thinking is scarcity – the idea that there is “not enough for everyone” – and the dramatic effects this reality has on human behaviour, and the measurement of behaviours is after all the DNA of economics. This allegation of scarcity is the foundation on which all of the economic systems of past and present are built. Hence the problem is, are conventional economics approaches (from which flow these heavily-referenced reports and surveys that inform us about the state of India’s agriculture and food) any use for analysing a post-scarcity economy? Such as the ones our 640 districts will face over the next 25 years, and indeed which they face every time there is a flood or a drought? I think not. We should rather break free from analysing these matters and issues in the binary terms of ‘price’ and ‘cost’ – these are economics ‘tags’ that we intuitively know have no significance in an agro-ecological system. For social scientists and multi-disciplinarians, this is simple enough, not so for the organs and apparatus of governance. Yet for the sake of reaching an understanding that is more in tune with the kisan, it is unavoidable. When will one culture of understanding displace the other? This may not be foretold, but can be encouraged. There are a few important insights that this paragraph provides. One, perhaps the most important, is that credit is presented as simultaneously a need for the small farmer and as a commodity (a scarce one, do you notice?). Two, there is a formal and an informal, and it is the products of the formal that are presented as possessing the ability to solve the small and marginal farmer’s problems. Three, there is a class stratification within the recipients of credit, those who are “financially included” and those who are not – and we have seen enough evidence over the last decade to show that the overlap of the marginal farmers and the financially excluded is very high, high enough to have been surprising two Plan periods ago, and for the measures this RBI report is discussing now, to have been not a preface, but an epilogue. Read the full comment on Agropedia. There’s a flurry of activity around the start of the G20 and the IMF-World Bank meetings. Some of this activity has to do with food and agriculture, and with the agricultural commodity markets and its ties to the financial markets. While the G20 has a lot to do with the growing strength of the BRICS bloc and the IMF, what stands out is a trenchant and insightful commentary by Unctad’s Trade and Development Report 2011 on the matter of agricultural commodities and the markets (exchanges rather) which control them. It has attracted the attention of Emerging Markets, a periodical (online too) which talked about food price and agricultural commodities markets with Joerg Mayer, senior economic affairs Officer at Unctad. Emerging Markets has quoted Mayer as having said that the risk management strategies promoted by the World Bank “only make sense if you assume that exchanges are working well for hedging purposes – and our research shows that, when large numbers of financial investors are present, they don’t work well“. Hear, hear. Mayer said that the World Bank’s approach would also be logical “if you assume that financial investors have no impact on prices, or that their presence improves [pricing]”. Of course to make such an assumption is to agree with an untruth, for Unctad’s Trade and Development Report 2011 has said quite plainly that strong investment across agricultural commodities markets mean that they have “followed more the logic of financial markets than that of a typical goods market”. Unctad’s research on the subject has shown that investors are motivated by “factors totally unrelated to commodity market fundamentals”. This is as bald an assessment of the behaviour of investors as you can hope to see from an inter-governmental organisation (the World Bank and International Monetary Fund are incapable of stating truths like this one). Unctad’s Trade and Development Report 2011 has argued for tighter regulation of financial investors, including limits on the positions taken by individual market participants; a rule to prevent banks that have insider information about commercially based market sentiment undertaking hedging operations for clients; a similar rule to prevent physical traders betting on outcomes they are able to influence; and a transaction tax or a requirement to hold positions for a minimum amount of time. Instead, the World Bank’s analysts have generally argued that price volatility is driven by fundamentals, such as input costs, which other economists have failed to include in their calculations. This is an argument that cannot stand up to the merest suggestion of an examination of the cost of cultivation for, while inputs do cost more from one year to another in high-input farming (in Asia and Africa and South America, even with smallholders who are held to ransom by industrial agriculture companies) these are not the “fundamentals” the Bank-IMF crowd insist are responsible. The trouble is, they won’t admit to any others. Worse, they have enfleshed this delusionary tack with the help of their old collaborators, such as JP Morgan, which now has a hedging business that works on agricultural commodities markets and this year joined the World Bank/International Finance Corporation to launch an Agricultural Price Risk Management Facility, “designed to fund small players to hedge more effectively” (nudge, nudge, wink, wink, etc). We think the G20 participants (finance ministers, central bank administrators and similarly high-powered persons) ought to have mentioned the matter. Instead, this is what they said. “The BRICS countries, represent quite a big share of the global economy. In today’s crisis period, internal demand of each economy is important, and we should find a way to enlarge internal demand in our economy.” – China Central Bank chief Zhou Xiaochuan. “We represent a group of countries where there is (an) enormous amount of demand for resources at home for poverty reduction … so there is going to be big, big tension between giving money to a multilateral institution for the purpose of restoring global stability and meeting our own aspirations at home.” – Reserve Bank of India governor Duvvuri Subbarao. “Enlarge internal demand” and “enormous amount of demand for resources at home”? Isn’t that exactly the sort of prognosis the World Bank, IMF and IFC will happily enlist as fundamentals of food prince index drivers? As for the rest of us, it’s back to promoting and practicing ecological economics. From ‘India and the Global Financial Crisis What Have We Learnt?’, by Dr Duvvuri Subbarao, Governor, Reserve Bank of India, as the K R Narayanan Oration, at the South Asia Research Centre of the Australian National University, Canberra on June 23, 2011. A few months into the crisis [the 2008-09 financial crisis], the Queen happened to be at the London School of Economics and asked a perfectly sensible question: ‘how come none of the economists saw the crisis coming’. The Queen’s question resonated with people around the world who felt that they had been let down by economics and economists. As economists saw their profession discredited and their reputations dented, the economic crisis soon turned into a crisis in economics. What went wrong with economics? It now seems that by far the most egregious fault of economics, one that led it astray, has been to project it like an exact science. The charge is that economists suffered from ‘physics envy’ which led them to formulate elegant theories and models – using sophisticated mathematics with impressive quantitative finesse – deluding themselves and the world at large that their models have more exactitude than they actually did. Admittedly, in a limited sense there may be some parallels between economics and physics. But similarity in a few laws does not mean similarity in the basic nature of the academic discipline. The fundamental difference between physics and economics is that physics deals with the physical universe which is governed by immutable laws, beyond the pale of human behaviour. Economics, in contrast, is a social science whose laws are influenced by human behaviour. Simply put, I cannot change the mass of an electron no matter how I behave but I can change the price of a derivative by my behaviour. The laws of physics are universal in space and time. The laws of economics are very much a function of the context. Going back to the earlier example, the mass of an electron does not change whether we are in the world of Newton or of Einstein. But in the world of economics, how firms, households and governments behave is altered by the reigning economic ideology of the time. To give another example, there is nothing absolute, for example, about savings being equal to investment or supply equalling demand as maintained by classical economics but there is something absolute about energy lost being equal to energy gained as enunciated by classical physics. In natural sciences, progress is a two way street. It can run from empirical findings to theory or the other way round. The famous Michelson-Morley experiment that found that the velocity of light is constant led to the theory of relativity – an example of progression from practice to theory. In the reverse direction, the ferocious search now under way for the Higgs Boson – the God particle – which has been predicted by quantum theory is an example of traversing from theory to practice. In economics, on the other hand, where the human dimension is paramount, the progression has necessarily to be one way, from empirical finding to theory. There is a joke that if something works in practice, economists run to see if it works in theory. Actually, I don’t see the joke; that is indeed the way it should be. Karl Popper, by far the most influential philosopher of science of the twentieth century, propounded that a good theory is one that gives rise to falsifiable hypotheses. By this measure, Einstein’s General Theory was a good theory as it led to the hypothesis about the curvature of space under the force of gravity which indeed was verified by scientists from observations made during a solar eclipse from the West African islands of Sao Tome and Principe. Economics on the other hand cannot stand the scrutiny of the falsifiable hypothesis test since empirical results in economics are a function of the context. The short point is that economics cannot lay claim to the immutability, universality, precision and exactitude of physics. Take the recent financial crisis. It is not as if no one saw the pressures building up. There were a respectable number of economists who warned of the perilous consequences of the build-up of global imbalances, said that this was simply unsustainable and predicted a currency collapse. In the event, we did have the system imploding but not as a currency collapse but as a melt down of the financial system. We will be better able to safeguard financial stability both at global and national levels if we remember that economics is a social science and real world outcomes are influenced at a fundamental level by human behaviour. India’s meteorological department has issued its second long range forecast for the 2011 monsoon and has lowered its estimate. Rainfall will be 95% of the 50-year average in the June-September season, which are the monsoon months. 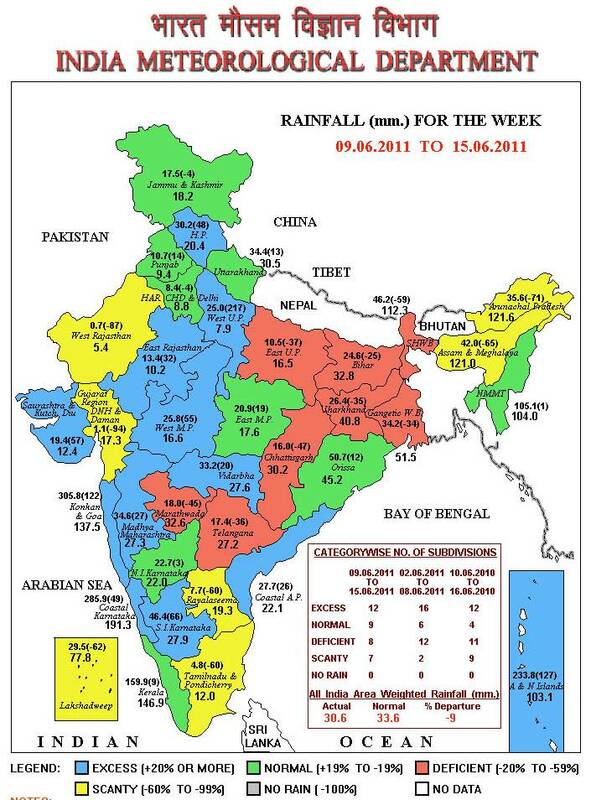 In April, the Indian Meteorological Department predicted a monsoon that would be 98% of the long-term average. Normal precipitation is considered to be 96%-104% percent of the long-term average. India’s agriculture-dependent population has been hoping for adequate rainfall to harvest good quantities of foodgrain and lentils for a second year and bring down inflation, which has led the Reserve Bank of India – the central bank – to raise rates for a 10th time in 15 months. Agriculture accounts for 14% of the economy and a reduced harvest can further lower rural incomes and send food inflation higher than it already is. 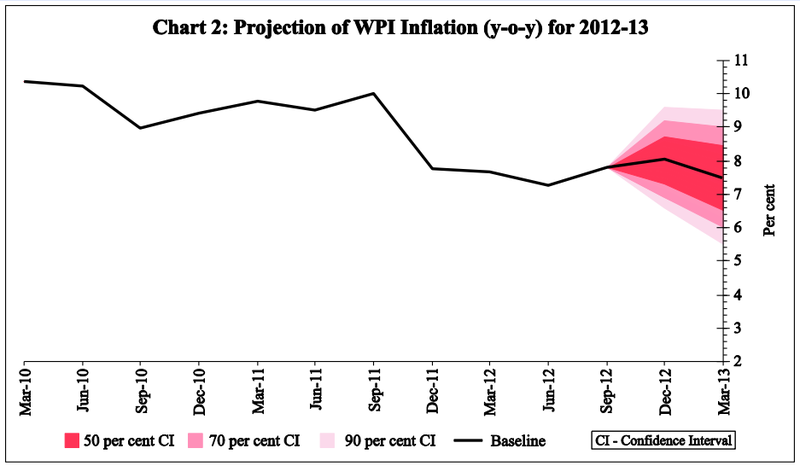 Inflation in India is the highest among Asia’s major economies. Bloomberg reported that the wholesale price index in India accelerated 9.06% in May after having increased 8.66% a month earlier, according to official data released on June 14. An index measuring wholesale prices of farm products including milk and lentils rose 8.96% in the week ended June 4 from a year earlier, according to the commerce ministry. India imported record quantities of sugar, lentils and oilseeds in 2009 following the weakest monsoon that year since 1972. (1) Rainfall over the country as a whole for the 2011 southwest monsoon season (June to September) is most likely to be below normal (90-96% of LPA). Quantitatively, monsoon season rainfall for the country as a whole is likely to be 95% of the long period average with a model error of ±4%. 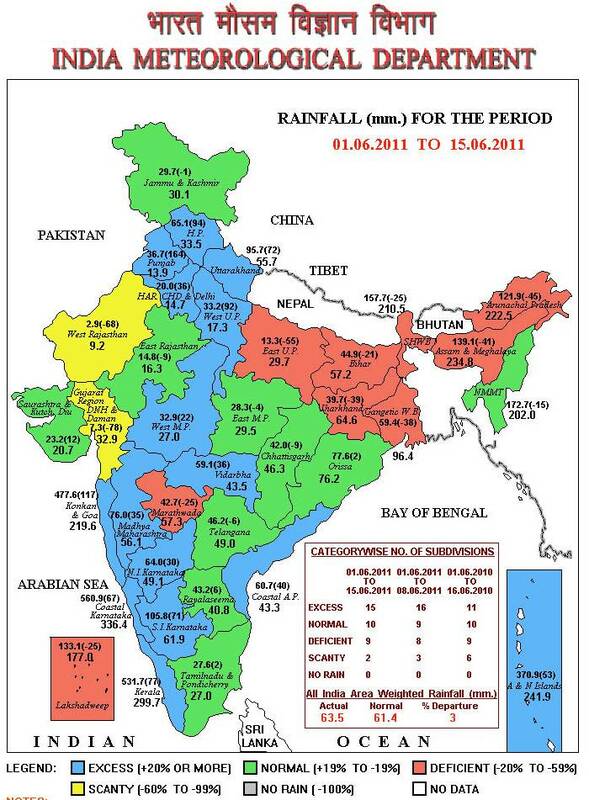 The Long period average rainfall over the country as a whole for the period 1951-2000 is 89 cm. (2) Rainfall over the country as a whole in the month of July 2011 is likely to be 93% of its LPA and that in the month of August is likely to be 94% of LPA both with a model error of ± 9 %. 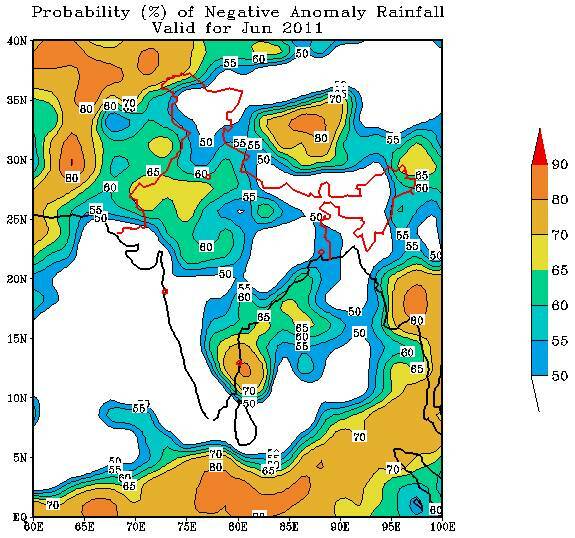 (3) Over the four broad geographical regions of the country, rainfall for the 2011 Southwest Monsoon Season is likely to be 97% of its LPA over North-West India, 95% of its LPA over North-East India, 95% of its LPA over Central India and 94% of its LPA over South Peninsula, all with a model error of ± 8 %. According to Reuters, government officials played down concerns that lower rainfall could fan inflation and dampen growth. “There is no need to press the panic button, as June rains are still above normal,” said Shailesh Nayak, the top civil servant in the ministry of earth sciences which controls the country’s weather office. 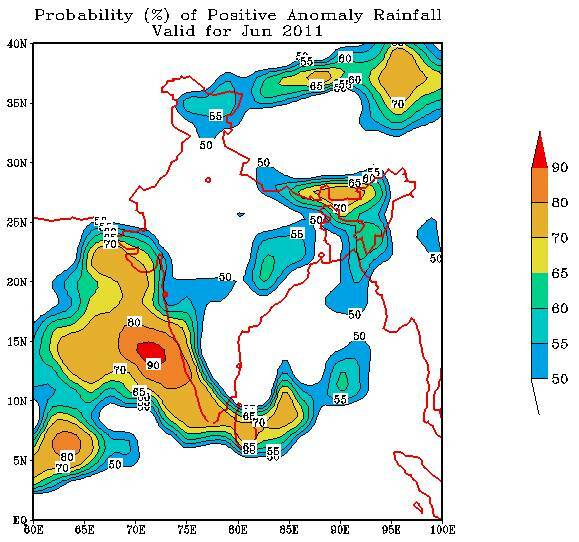 While rains could be slightly lower than normal in July, India’s chief forecaster said distribution was key. “There are chances the monsoon will pick up after July 15 once it covers the entire country,” said D. Sivananda Pai, director at the state-run National Climate Center. “Don’t go by the numbers, it is the distribution (of the rains) which we are still hoping to be good.” The weather office predicted 27 centimetres of rain in July compared with long-term average rainfall of 29 centimetres, and rains at 24 centimetres in August, when seeds start maturing, compared with long-term averages of 26 centimetres. Weather office chief Ajit Tyagi remained optimistic. “Ninety five percent is a good forecast,” Tyagi said. 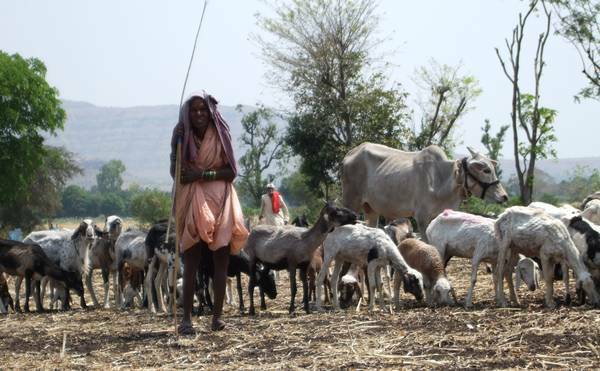 “Had it been 90% of the long-term average then it would have been a cause for concern,” he said, adding that in the past slightly below normal monsoon rains had also seen adequate farm output because they were well distributed in the major crop growing regions. Explaining climatic conditions over the equatorial Pacific and Indian Oceans, the department’s second long range said moderate to strong La Nina conditions that prevailed in the equatorial Pacific during mid-August 2010 to early February 2011 weakened during subsequent months and dissipated to neutral conditions around mid-May 2011. The latest forecasts from a majority of the dynamical and statistical models indicate strong probability for the present ENSO-neutral conditions to continue during the current monsoon season and the remaining part of 2011. It is important to note that in addition to El Niño and La Niña events, other factors such as the Indian Ocean Sea surface temperatures (SSTs) have also significant influence on India monsoon. However, the latest forecasts do not suggest development of either a positive or a negative Indian Ocean Dipole event during the 2011 monsoon season. In the absence of strong monsoon forcing from both Pacific and Indian Oceans, intraseasonal variation may become more crucial during this southwest monsoon season and lead to increased uncertainty in the monsoon forecasts. From 2010 September, the microfinance sector in India and South Asia has been questioning the basis of ‘growth’ in the sector and suggesting (at times strenuously) that the fundamentals be re-examined. 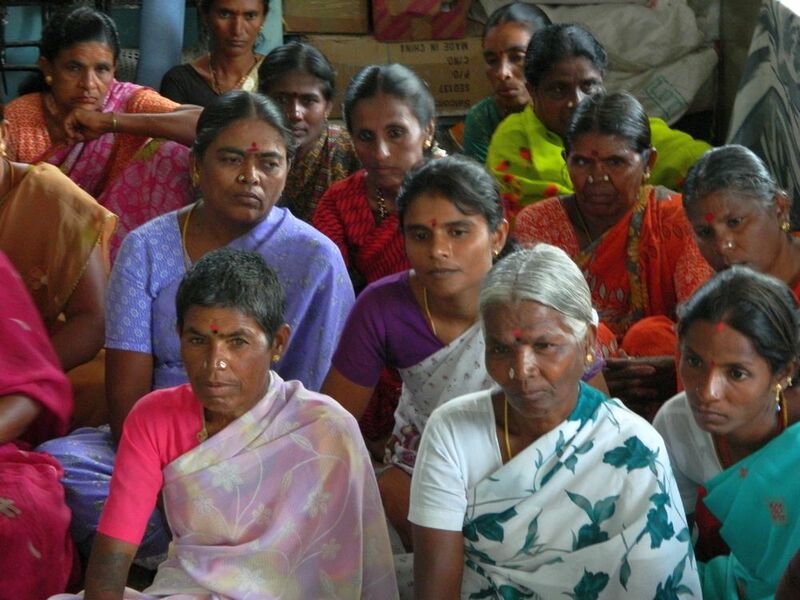 India-based social business advisory firms such as Intellecap had analysed the build-up to the microfinance crisis in Andhra Pradesh, India. Microfinance companies have had to balance their commercial interests with the social and moral expectations of a wide variety of stakeholders. 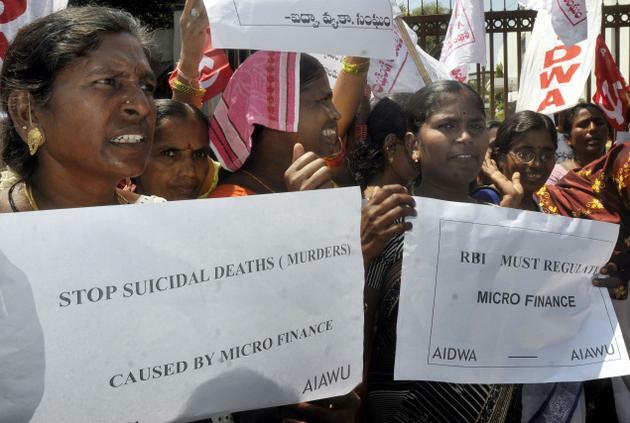 Muted before the crisis, the allegations became loud and threatening during – of coercive practices, lack of transparency, and usurious interest rates which had led to suicides by borrowers in Andhra Pradesh. The sector had advised against knee-jerk ordinances in response to the crisis as being more damaging to borrowers than punitive to irresponsible or criminal lenders. The solutions they sought are stronger ethical practices, reporting and compliance rules and transparency. The new Reserve Bank of India measures – now heavily reported and commented on – are the first step towards those solutions. India’s Reserve Bank has released a report to study the issues and concerns in the microfinance sector, which has gone through a major crisis in 2010. The Report of the RBI Sub-Committee of its Central Board of Directors to study issues and concerns in the micro finance institutions (MFI) Sector is summarised here [pdf]. The RBI said: “Credit Support to Micro Finance Institutions (MFIs). 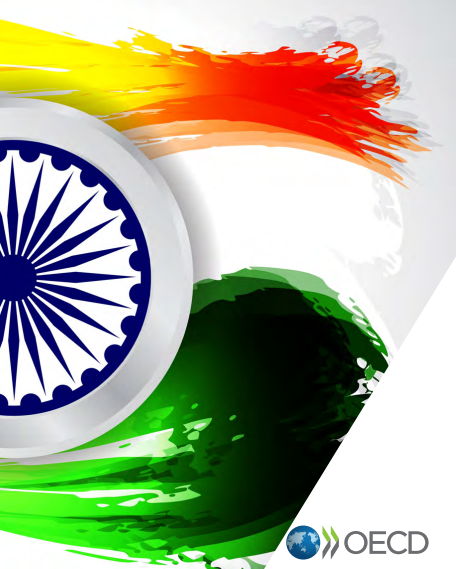 The Reserve Bank of India had held discussions with select banks on December 22, 2010 to get an assessment regarding the ground level situation in the microfinance sector in Andhra Pradesh and other States and the need for any interim measures. The banks informed that collections by MFIs in Andhra Pradesh had deteriorated considerably and there were some incipient signs of contagion spreading to other States. Subsequently, IBA based on the feedback received by them from banks had come up with a proposal that there is a need for extending certain relaxations in the restructuring guidelines of RBI for the MFI sector.” The Sub-Committee statement is here [pdf] and RBI’s credit statement is here [pdf]. The financial press has reported the RBI’s intervention extensively. “India’s central bank Wednesday allowed a special relaxation to banks in restructuring loans to microlenders, a move that will give lenders temporary flexibility in providing credit support to the cash-strapped institutions,” reported the Wall Street Journal. The Reserve Bank of India (RBI) has asked banks to go easy on microfinance institutions (MFIs) by relaxing certain norms regarding loan restructuring. Banks can now restructure loans extended to MFIs even if they are not fully secured, Business Standard reported. The Economic Times reported that under the new rules, restructured loans to the microfinance sector, can be classified by banks as standard assets, even though such loans are typically unsecured. The temporary relaxation of asset classification rules for bank loans to the microfinance sector is a move that it said will allow them to continue lending to the industry. 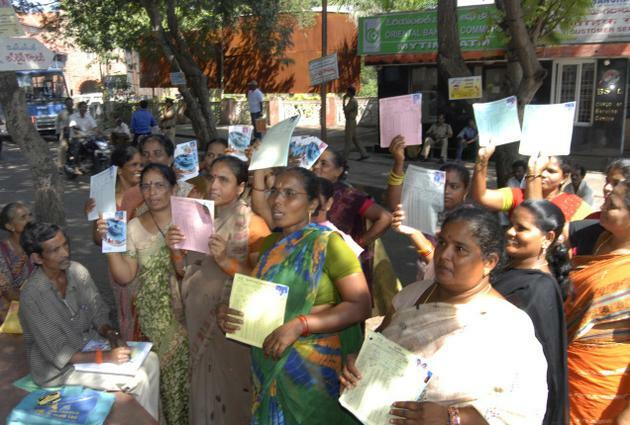 The Hindu reported that to revive the crisis- ridden micro finance sector, a Reserve Bank of India Committee on Wednesday suggested that micro finance institutions (MFIs) be allowed to charge a maximum interest of 24 per cent on small loans which cannot exceed Rs.25,000. There’s more on the RBI statements and longer extracts from the reportage here. 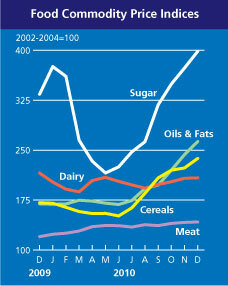 The UN Food and Agriculture Organization’s food price index has risen to 214.7 for December 2010, which is above its peak of 213.5 in June 2008. This new peak, at a time when the price of crude oil is above USD 90 a barrel, is the strongest signal yet that global foodgrain supply has entered a critical phase. 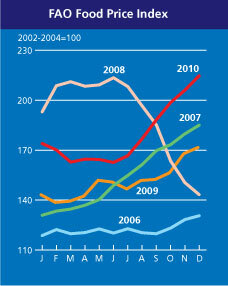 The FAO index has been rising steadily through the second half of 2010 – we discussed it here. The cereal price index stands at 237.6 which is almost 40 points below the peak of 274.3 (in April 2008). The oils price index stands at 263 which is just under 20 points less than the peak of 282.6 (in June 2008). The dairy price index stands at 208.4 which is 60 points under the peak of 268.6 (in November 2007). But the sugar and meat price indices are at all-time highs. The meat price index is now at 142.2 (in September 2008 it was 137.4 and its previous all-time high was 139.3 in September 1990). The sugar price index is now at 398.4 which is an extraordinary 180 points above its all-time high of 218 (in March 1990 – it was 207 at the maximum during 2008). The sugar price index crossed 300 in August 2008 and remained above 300 until March 2010, and again crossed 300 in September 2010. A Bloomberg report quotes FAO senior economist Abdolreza Abbassian: “One might expect prices to come down in spring, and this may be in fact the worst. But given how unexpected the weather events have been, I for one would not want to bet on anything along those lines.” The report said that concern about drought doing harm to Argentine harvests helped corn jump 52% in Chicago last year and soybeans to rise 34%. Prices also gained as China, the world’s largest soybean buyer, became a net corn importer. Wheat added 47% in 2010 as Russia, hit by its worst drought in a half-century, banned all cereal exports. Agrimoney has a report polling commodities fund managers in several financial centres worldwide for their views. What they say about the impact major forecasts, such as the World Agricultural Supply and Demand Estimates, have is worth paying close attention to. The WASDE report provides the US Department of Agriculture’s comprehensive forecasts of supply and demand for major US and global crops. Unseasonal rains are officially blamed for pushing up prices of vegetables such as onions and tomatoes, but some commentators point instead to poor agricultural productivity and transport after years of few reforms and weak government investment. Onion prices, a key food staple for Indian families, rose over 23% percent over the week to December 25. The food price index rose 18.3% in the year to December 25 and the fuel price index climbed 11.6%. This compared with 14.4% and 11.6% annual rises the previous week. The Wall Street Journal has said that food prices in India are continuing their sharp rise, increasing concerns among economists about a prolonged spell of high prices and adding pressure to the central bank to raise interest rates later this month. “The Reserve Bank of India next meets on Jan. 25 to consider an interest rate rise after pushing up rates six times in 2010 – one of the most aggressive tightenings of any central bank. But calls for a further move keep coming, most recently with the International Monetary Fund saying in a report released Thursday that rates need to be higher to curb inflation. This short comment has been written for India’s alternative economics group, Macroscan, and you’ll find it here. The first release of summary data from the 64th round of the National Sample Survey Organisation, ‘Household Consumer Expenditure in India 2007-08‘ (NSSO report 530), captures the early impact of the rising trend in food prices for rural and urban India. This period is significant in the recent history of food price rise in India, for it signals the strengthening of the factors that led to the retail food price highs of 2008 which began to be recorded around two years earlier. Several of the most important factors have to do with the rapid pace of urbanisation (most visible in the non-metro tier 1 cities) and the steady growth in the food processing and food logistics industries, which has taken place alongside the deepening of the agricultural commodity markets. “To judge from survey data of food intakes, the situation has been getting worse rather than improving, at least in terms of per capita calories consumed, and this phenomenon is fairly widespread affecting all classes, rural and urban and those below and above the poverty threshold,” the FAO report, ‘World agriculture: towards 2030/2050‘ had stated in 2006 in its comment on India’s growth-malnutrition paradox. 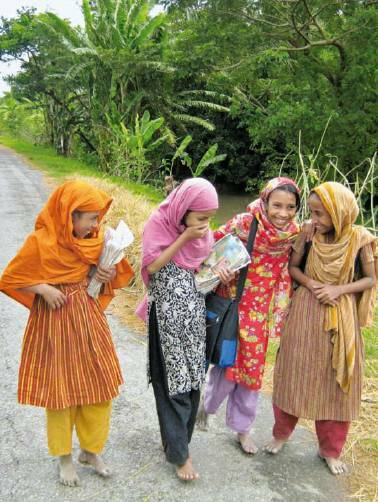 The report’s authors had at the time commented that matters in India “are getting worse in the rural areas as people have to pay more than before for things like fuel and other basic necessities of life” and that rural incomes have not improved at anything near the rates implied by the high overall economic growth rates. To illustrate the continuing impact of rising cereal prices on rural households in Bihar, Chhattisgarh, Jharkhand, Madhya Pradesh and Orissa, district per capita incomes for 2004-05 to 2009-10 are estimated for five representative districts from these states. These are districts that record a median per capita income based on data for the 2004-05 year (the last NSSO household consumption survey year) available with the Planning Commission’s district domestic product tables: Bhabua in Bihar, Dhamtari in Chhattisgarh, Deoghar in Jharkhand, Khandwa in Madhya Pradesh and Jajpur in Orissa. The per capita income increases in these districts are recorded upto 2006-07, and taking the national GDP growth rate for the years following (9.7%, 9.2%, 6.7% and 7.2%) the overall finding is that statistical per capita income increases are between 36% (for Khandwa) and 47% (for Dhamtari) for the period 2005-06 to 2009-10. In these five states, the cereals basket occupies a dominant share of monthly per capita expenditure (MPCE) on food, accounting for 42% of MPCE on food and 25% of total MPCE in Bihar, 41% and 21% in Chhattisgarh, 42% and 25% in Jharkhand, 33% and 17% in Madhya Pradesh, and 42% and 24% in Orissa. 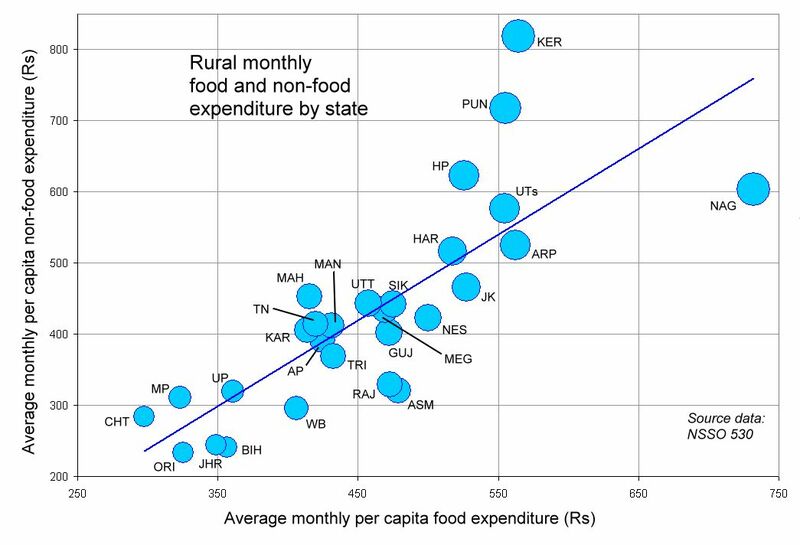 The impact of a steady upward trend in the prices of cereals in these states – whose rural households spend roughly the same on food as they do on non-food needs (see Chart 1) – can be gauged from retail price data on essential food items collected by the Department of Economics and Statistics, Ministry of Agriculture. This data, although the most reliable weekly series recorded in a number of centres in the country, is weakened by deficiencies (gaps in series, numerical mismatches and so on). Even so, the patterns they provide are valuable. From 2005 January to 2010 January, the prices of atta in Sehore and Bhopal (MP), of desi wheat in Bhopal and of maize in Patna have risen by 200%. The prices of ‘kalyan’ wheat (a widespread HYV cultivar) in Bhopal, Sehore and Patna (Bihar) have risen by 173% to 177%; the prices of maize in Ranchi (Jharkhand) and common quality rice in Bhubaneshwar (Orissa) have risen by 171%; the prices of ‘desi’ wheat in Patna and atta in Ranchi have risen 170%; and the prices of common rice in Cuttack and in Dhanbad (Jharkhand) have risen by 169% and 164%. Over this period, the price of the available basket of cereals has risen 157% in Cuttack, 162% in Bhubaneshwar, 159% in Sehore, 174% in Bhopal, 176% in Patna, 166% in Ranchi and 152% in Dhanbad. 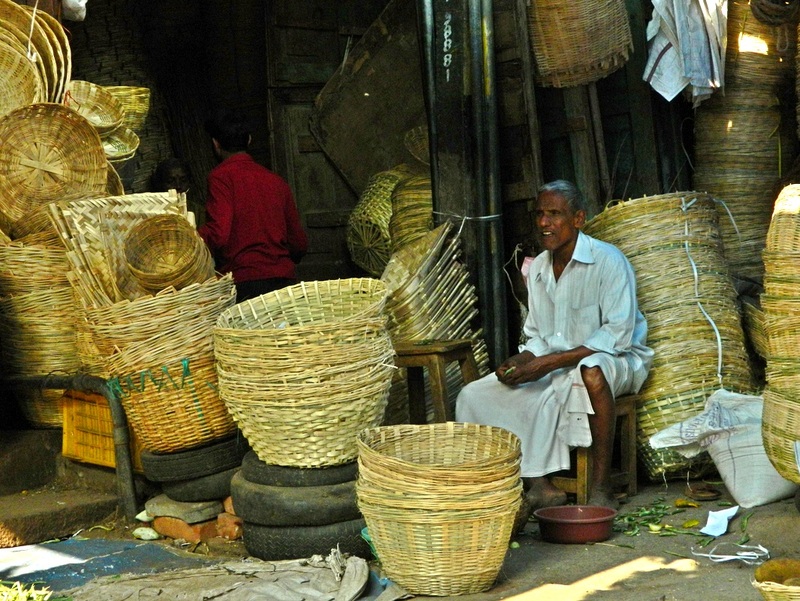 Erratic data posting (and possibly validation difficulties) have meant that a better understanding of the food baskets of North-East India is yet to be achieved. Even so, NSSO 530 shows the heavy reliance by the households of the North-Eastern states on cereals (rice) with the regional average consumption greater than that of the states of eastern and central India in which rice also play a major dietary role: West Bengal, Orissa, Chhattisgarh, Bihar and Jharkhand. What Chart 2 illustrates is that for those regional populations dependent on rice, the cost of this dependency is high. 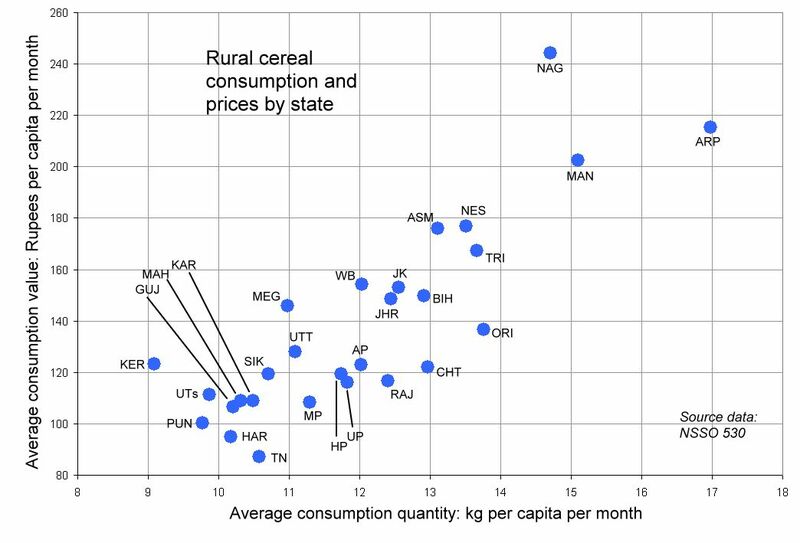 This is not so for wheat in Punjab and Haryana, whose average per capita consumption quantity of the cereal is both relatively low (as a percentage of the cereal component of the food basket) and less expensive. For Gujarat, Maharashtra and Karnataka – all three states affected by rapid urbanisation and absorbed by the race to build urban and transport infrastructure – their rural households are far less dependent on a single cereal than their counterparts in North-East, Eastern or North India. 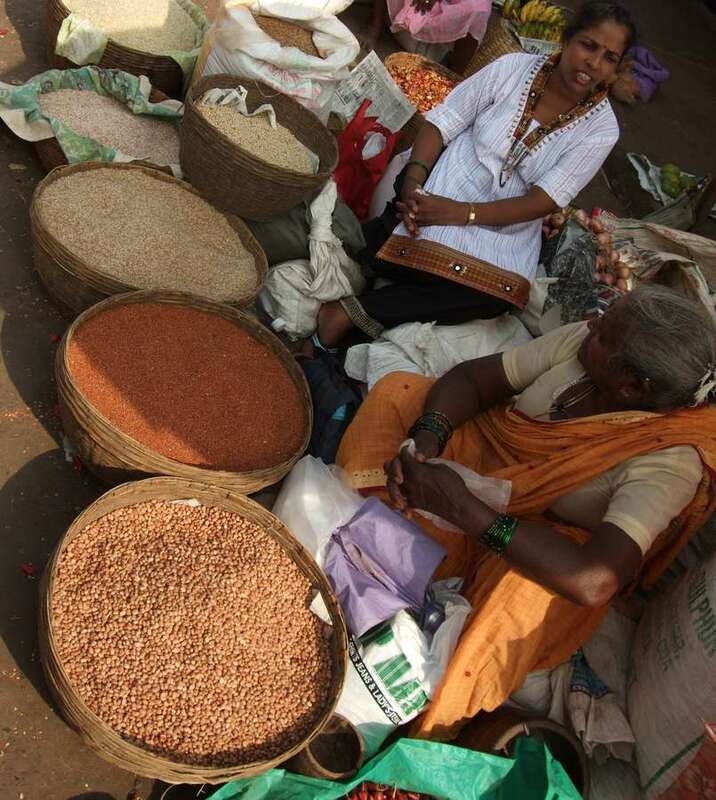 Wheat is the preferred cereal in Gujarat but accounts for no more than 40% of the total cereals purchase; rice is the preferred cereal in Karnataka but accounts for no more than 53% of the total cereals purchase; wheat is the preferred cereal in Maharashtra but accounts for no more than 36% of the total cereals purchase. At the same time, the Government of India has approved proposals for joint ventures and foreign collaboration (including 100% FDI) in processed food businesses (including 100% export oriented units), and “mega food parks”. According to Indian Credit Rating Agency (ICRA), the processed food market accounts for 32% of the total food market with the “most promising” sub-sectors listed as soft-drink bottling, confectionery manufacture, fishing, aquaculture, grain-milling and grain-based products, meat and poultry processing, alcoholic beverages, milk processing, tomato paste, fast-food, ready-to-eat breakfast cereals, food processing, food additives and flavours. From the point of view of the major national industry associations (CII, FICCI, Assocham) the approximately 7,500 regulated mandis lack critical infrastructure, the provision of which will cost at least Rs 12,000 at 2009 prices. 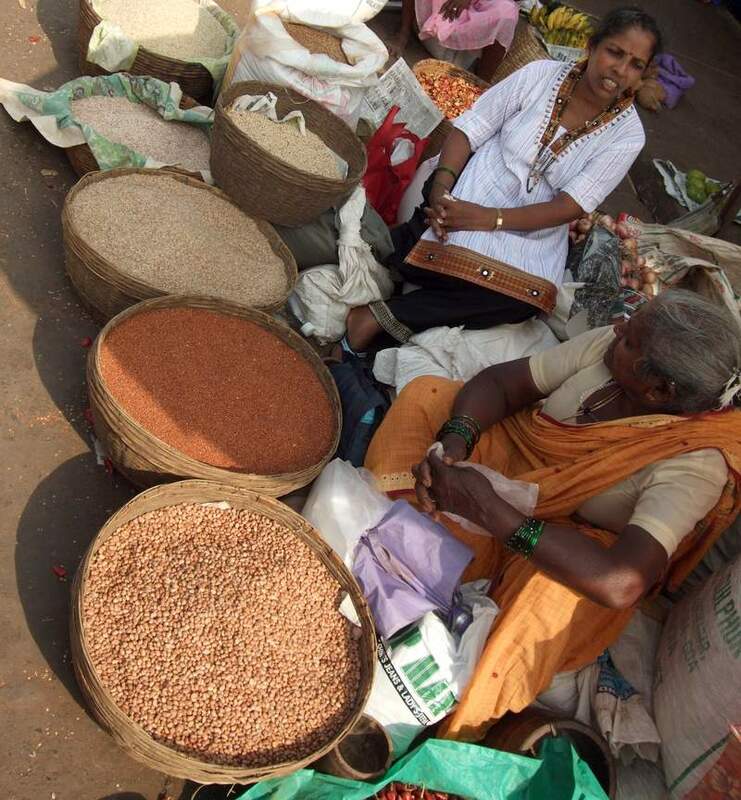 The potential of the public-private partnership model in the foods business is seen by industry as being embodied in ventures such as Safal market in Karnataka (considered an example of wholesale market modernisation), ITC’s e-Chaupal, Hariyali Kisan Bazaar, Mahindra Shubh Labh, Cargill Farmgate Business and Tata Kisan Sansar.